In Australian media news this week, a new website announcement and two new website launches: Fairfax Media’s Executive Style section will become its own site, and The Guardian and Ninemsn have both relaunched their online presences. 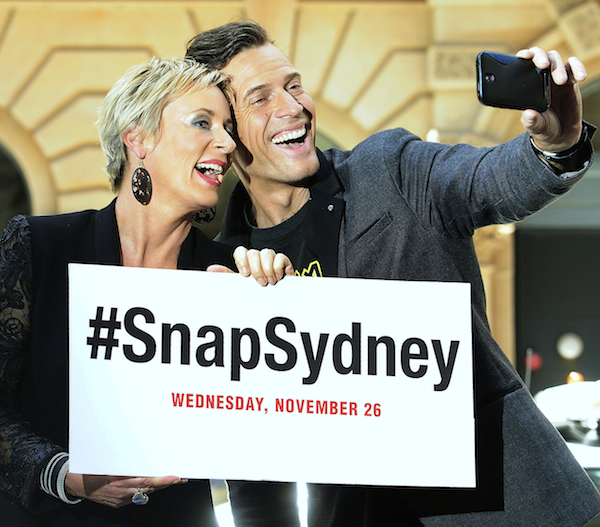 NewsLocal’s #SnapSydney campaign last week attracted its community to post 7000 images to social media, and a new study from Wieck unveils some trends around the media’s relationship with PR. Fairfax Media is launching its metro dailies’ popular Executive Style section as its own website early next year due to “overwhelming audience and advertiser demand”. The new site will feature video content, social media and sections to interest the luxury advertising sector such as fine drinks and dining, high-end property, watches and jewellery. Advertisers will have opportunities including content marketing, video, digital ad units and “the opportunity to own exclusive environments”, Fairfax Media says. 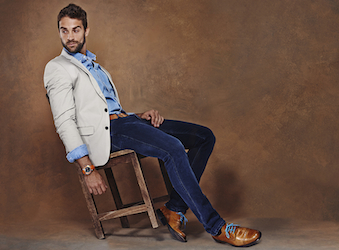 “ExecutiveStyle.com.au will be a high-end lifestyle destination for men who appreciate the good things in life. Its content will inspire success with a diverse mix of intelligent and sophisticated luxury, lifestyle and style content for the Australian Man,” ExecutiveStyle National Editor Steve Colquhoun said. Since 2008 Executive Style has been a dedicated section in The Sydney Morning Herald, The Age, The Canberra Times, BrisbaneTimes.com.au and WAToday.com.au. The Guardian Australia has launched its new website after a 10-month beta testing phase in which it received more than 40,000 user feedback comments. The new website, fully-responsive across platforms, features a flexible ‘container’ format and a clearer emphasis on live and up-to-date news. The company says the new format reflects the way that people consume news and features, rather than the way that journalists categorise them. 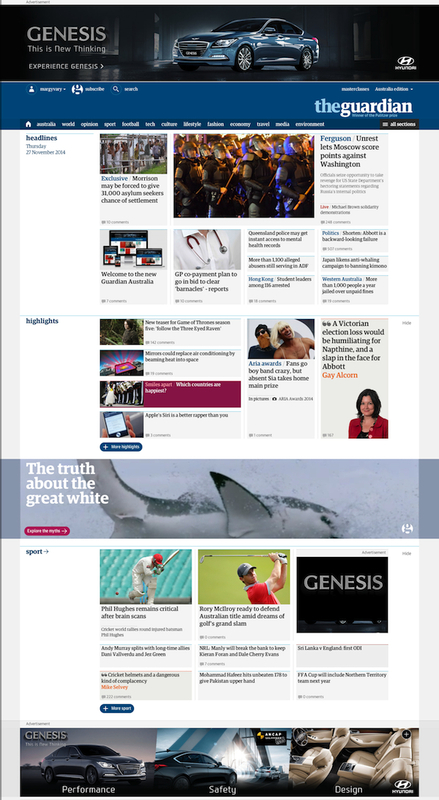 Launch partner Hyundai is taking advantage of The Guardian‘s new creative formats with a high impact display campaign and a content element around its new Genesis model. Ninemsn has also launched a new responsive website with a “bigger, brighter and bolder design” and increased advertising opportunities. 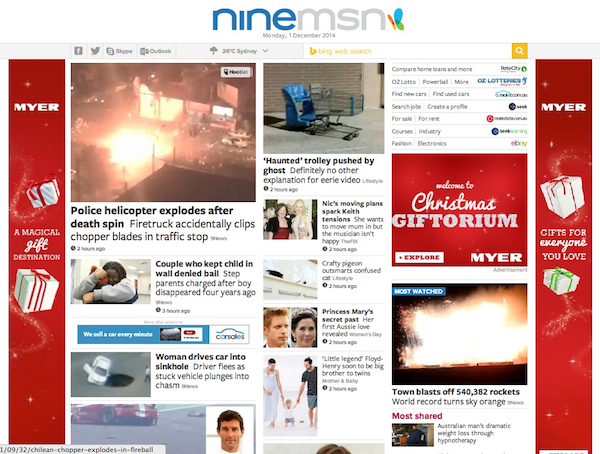 The company says the new site is just part of a transformation of the entire Ninemsn network. Sydney-siders posted 7000 images of Sydney to social media using the #SnapSydney hashtag as part of last Wednesday’s NewsLocal event. NewsLocal and The Daily Telegraph websites curated the images from Facebook, Twitter and Instagram on a digital wall during the day, attracting visitors. NewsLocal will also select the best images to publish in special edition print wraps and inserts in its 20 community newspapers. The campaign aimed to bring the Sydney community together and create a “photographic time capsule”. The media is growing more dependent on public relations professionals, a survey by Wieck has found. Wieck’s 2014 ‘PR Perceptions vs Media Realities’ white paper analysed responses from 354 media and 181 PR people on the use of PR material. An “alarming” number of journalists were often deleting emails without reading them due to the source or the subject line, Wieck Australian CEO Warren Kirby said. 80% of media professionals surveyed said they used supplied video. “Only around 20% of respondents work in TV, so much of the video is being used online, which creates the need for multiple formats,” Kirby said. The study found most media preferred to be sent download links rather than large attachments, with a choice of images and multimedia content in a range of formats. “The media said the major factor when sourcing content from PR material was relevance to their audience and location, closely followed by writing style and delivery method,” Kirby added.